Comprehend active management style drift. When you buy a box of Corn Flakes, you expect corn flakes in your cereal bowl. It is a safe and reasonable assumption that you are getting what you think you are buying. You know you are not buying granola or oatmeal. The name on the box is true to the box’s contents. There are different risk characteristics among the many categories of investment styles. An index or asset class is designed to carry a particular risk exposure, a key identifying factor for any fund. Market capitalization styles include large cap, mid cap, small cap, and micro cap stocks. A growth style commonly pertains to stocks that have experienced rapid growth in earnings, sales or return on equity, as well as low book-to-market ratios (BtMs). A value style, on the other hand, refers to stocks that have carried low price to earnings ratios, high BtMs, and are often labeled as “distressed.” Beyond these broad descriptions, funds are sorted into categories such as domestic, international, emerging markets, select technology, health care, energy and others. No industry wide standards exist for defining these terms, making it hard for proper benchmarks to define what constitutes value, growth, large cap, small cap, international, or emerging market stocks. To make matters even more difficult, carefully crafted fund prospectuses give active fund managers significant leeway to deviate from their fund’s stated investment style. As a result, companies with divergent risk and return characteristics are often lumped together into the same style. When active fund managers assume their fund’s investing style will underperform, they often abandon their stated strategies to chase the returns of other investment styles. For example, when small company fund managers forecast a slump in small company stocks, they may start buying large cap stocks in hopes of beating small cap benchmarks. As you will see, about 75% of actively managed funds utilize investments that do not reflect their stated objectives. 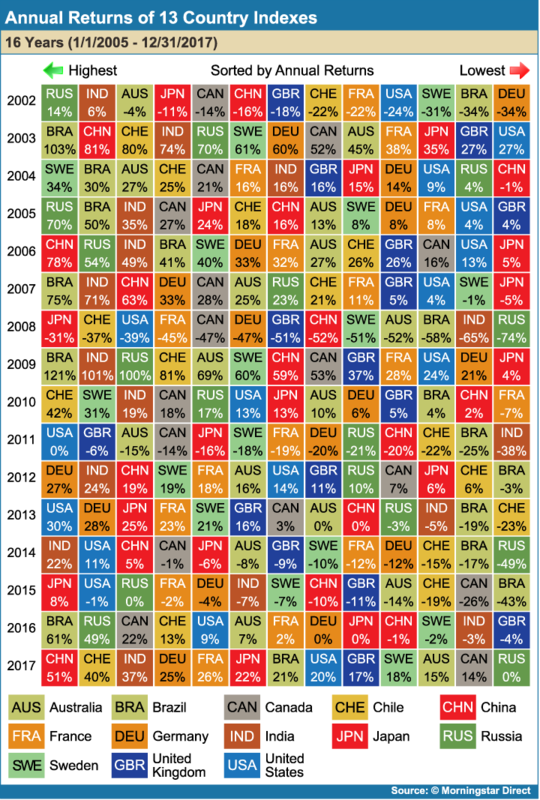 The next three charts reveal the difficulty of identifying a winning style in advance. 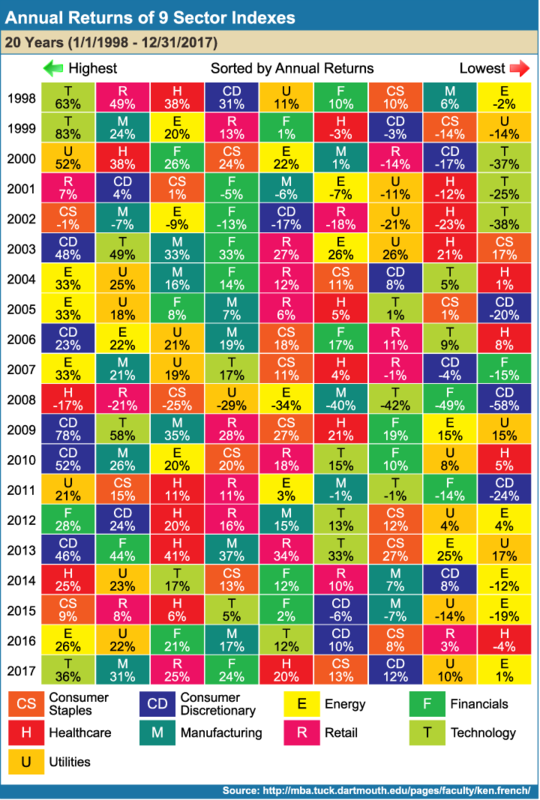 Figure 6-1 displays the Annual Returns of 13 Asset Class Indexes for the 20-year period from 1998 through 2017 and shows that high and low returns of key market indexes follow no discernible pattern. Figures 6-2 and 6-3 show the same is true for the historical returns of various countries and industrial sectors. Investors who attempt to overweight or underweight specific styles based on speculation about future market movement undermine their ability to achieve the risk-adjusted returns that result from maintaining a proper asset allocation made up of a consistent blend of investment styles. In the 1980s, Fidelity’s Magellan fund and its then-manager Peter Lynch were touted for outpacing the S&P 500 Index. However, Lynch had achieved his big returns by concentrating a large portion of the fund’s holdings in small cap stocks. In so doing, his investors were unwittingly exposed to a higher level of volatility that may not have been in line with their investment objectives. Magellan’s returns looked good when measured against the S&P 500 Index, an inappropriate benchmark that included no small cap stocks. The appropriate benchmark for Magellan would have been a blended index of both small cap and large cap equities. 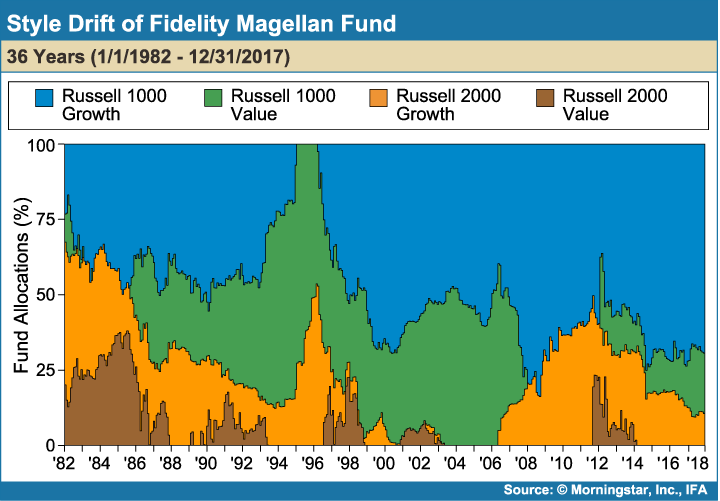 Figure 6-4 illustrates the style drift of Fidelity’s Magellan fund from January 1, 1982 through December 31, 2017. The scale on the vertical axis represents the fund’s relative exposure to different styles, and the different colors represent different investing styles. 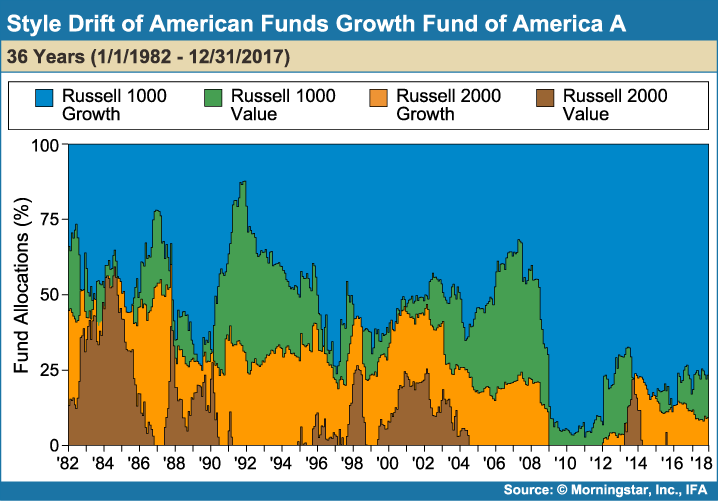 In 1995, the fund looked like a large value fund (green), but between 2000 and 2009, it would have been seen as a large growth fund (blue). This ongoing shift causes the fund’s investors to unknowingly be allocated to risks different from what they thought. In the mid-1990s, Jeffrey Vinik took over the fund’s helm. He made a famous market call in November 1995, bailing out of $10 billion worth of technology stocks. This is visible in Figure 6-4 by the disappearance of the blue section (Large Growth) in 1995. He put a lot of that money into cash and bonds. During the next six months, Magellan’s value barely moved, as the Large Growth index grew by 11.3%. As a result, investors suffered from lower returns and higher capital gains taxes. To expand the analysis, let’s look at two additional mutual funds whose exposure to different styles drifted over time. 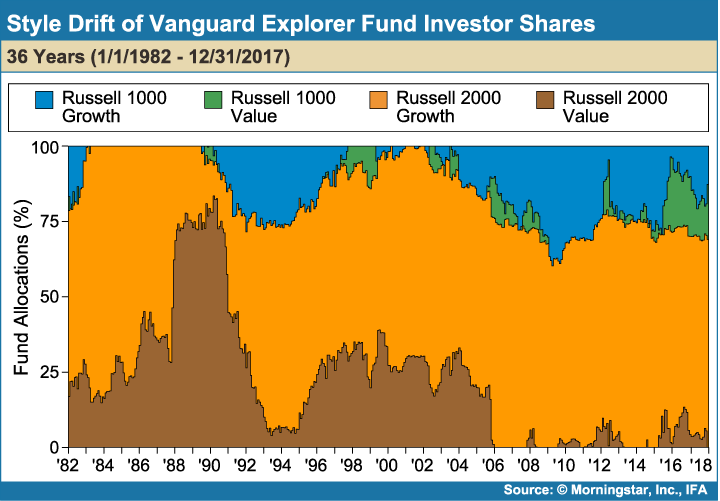 Figure 6-5 displays the style drift of the actively managed Vanguard Explorer Fund, which is designated by Vanguard as a small growth fund. Note that the tan zone is a small growth index, and the brown is a small value index. The fund experienced a spike in exposure to small value in the early 1990’s, shifting it away from its original allocation and altering its risk exposure for its investors. Similarly, Figure 6-6 illustrates the style drift of the Growth Fund of America, which is designated as a large growth fund. Note the lack of style consistency as the various indexes in the fund seem to move up and down like a roller coaster. Both of these funds did not stay true to their stated identity. 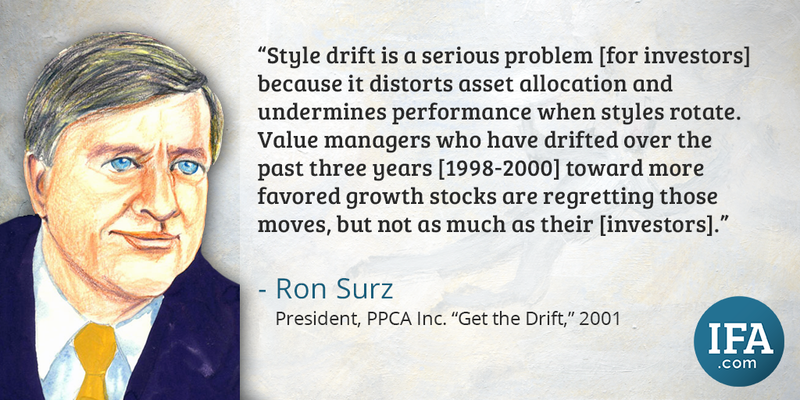 Normally, style drift refers to something like a value fund that dabbles in growth stocks or a large cap fund that drifts into small cap stocks. An article in The Wall Street Journal on May 2, 2013, “Bond Funds Running Low on…Bonds,” puts a whole new spin on style drift. Faced with very low bond yields, some active bond fund managers have resorted to buying stocks. 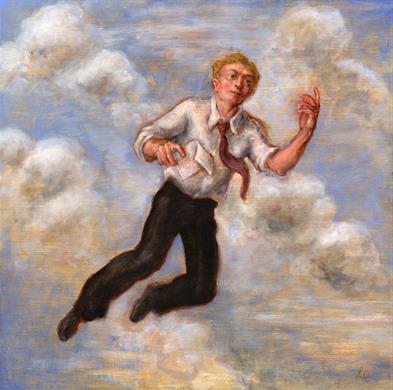 According to Professor Russ Wermers of the University of Maryland, “When bond-fund managers buy stocks, they’re reaching for yield in the form of dividends”.1 However, high-dividend stocks are not a free lunch. An increase in yield always comes with an increase in risk, and dividend-paying stocks are far riskier than bonds. According to Morningstar, 386 mutual funds classified as bond funds held stocks at the end of the fourth quarter of 2017. This represents a 24% increase over 312 as of year-end 2012. A somewhat extreme example is the Wells Fargo Real Return Admin Fund, which had only 3% allocation in 2012, but now has just under 18% of its assets in stocks, according to Morningstar. One of the problems with this style drift is the 2017 returns will be very different from, and frequently higher than, their prospectus benchmarks, which are usually pure bond indexes. In the case of the Wells Fargo Real Return fund, its prospectus benchmark is an inflation protected bond. Comparing returns of a bond fund with equities to a bond benchmark without equities can lead naïve investors to believe that active managers possess some sort of advantage during low-interest rate periods. However, there is no evidence that the bond market suddenly became inefficient. On the contrary, just like stock traders, bond traders turn over every stone, looking for mispriced bonds. An appropriate use of bonds in a portfolio is to dampen the volatility of the equities, where the portfolio’s risk should be taken. When investors access bonds through low-cost index funds, they do not need to be concerned about style drift into stocks. Tactical asset allocation refers to the practice of changing the composition or style of a portfolio based on market conditions. An example would be selling a portion of the portfolio’s bonds and buying stocks when the earnings yield on stocks has risen above a benchmark interest rate. Of course, the parties on the other side of these trades are well aware of these changed market conditions, so the prices paid and received by the tactical allocator are fair and impart no expectation of an additional risk-adjusted return. Figure 6-7 displays the results of a study of the only 24 mutual funds with a 20-year record based on tactical asset allocation as of December 31, 2017. As the chart shows, only three funds plot slightly above the line of index portfolios. While 3 of 24 (12.5%) is rather dismal to begin with, the true percentage is much lower because we are only looking at funds that survived for the last 20 years. 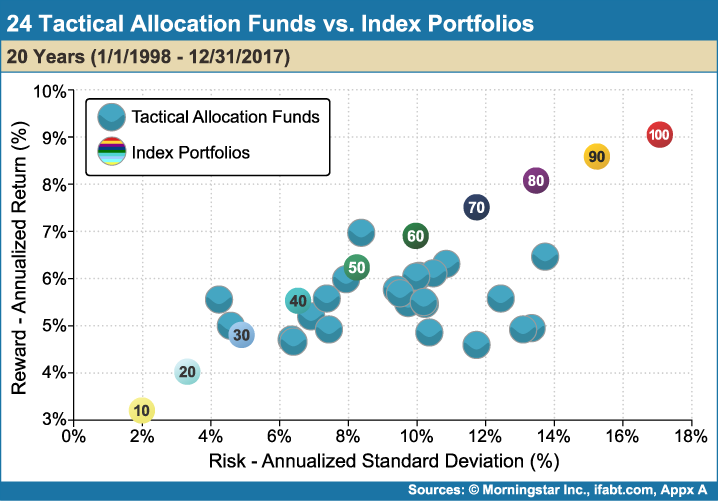 An investor who chose a tactical allocation fund 20 years ago had a very small chance of both keeping the same fund and beating a risk-appropriate allocation of index funds. 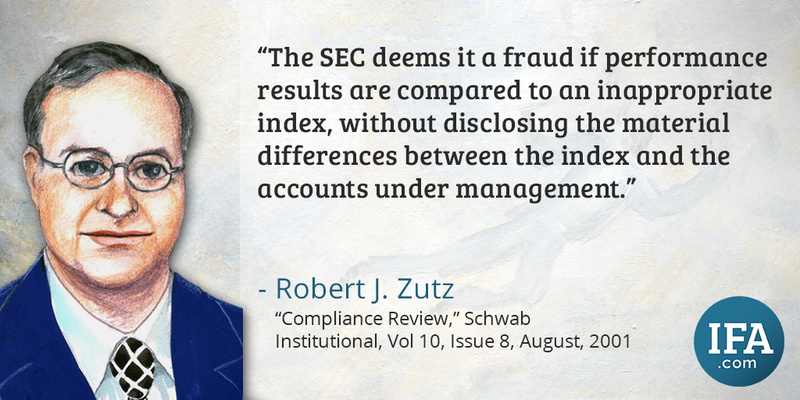 Index funds are created according to specific criteria, and in accordance with an index, allowing for accurate tracking and prevention of style drift. 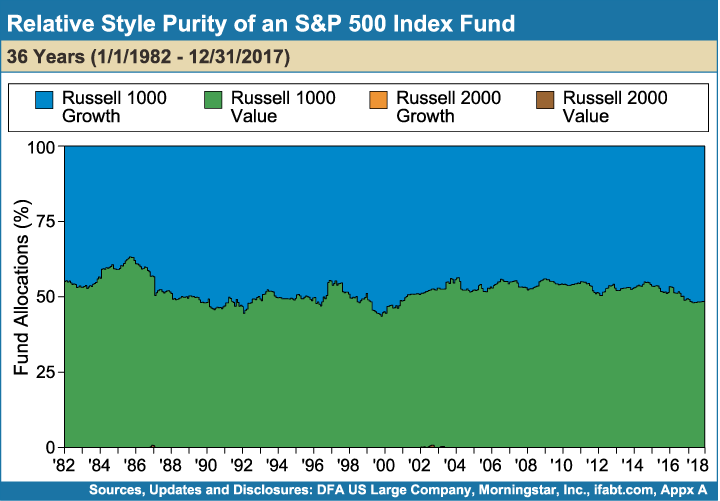 Figure 6-8 shows the style purity of an S&P 500 Index Fund over a 36-year period. In contrast to the drift of the three previous funds, the index fund maintained relatively constant exposure to large growth and large value equities over the entire period. 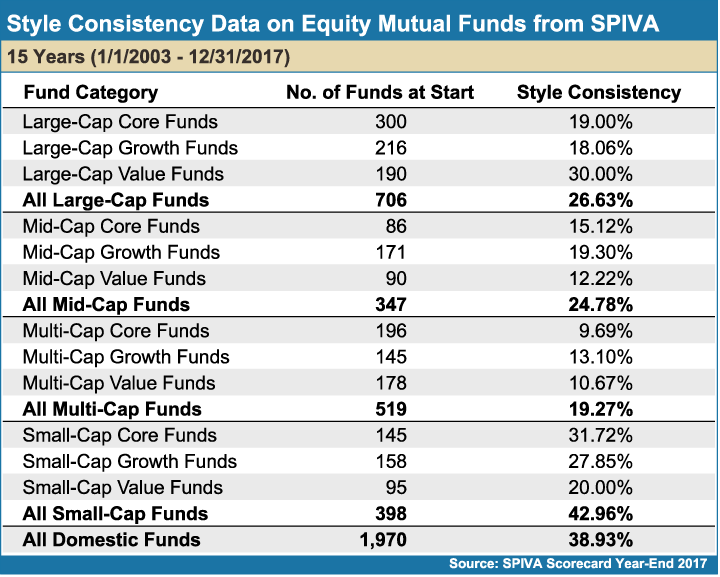 he Standard & Poor’s Indices versus Active Funds Scorecard2 (SPIVA®) is a report that provides information on the consistency or “persistence” of funds staying true to their styles. Data from the year-end 2017 report is shown in Figure 6-9, revealing the inconsistency or lack of persistence in the list of funds from 2003 through 2017. 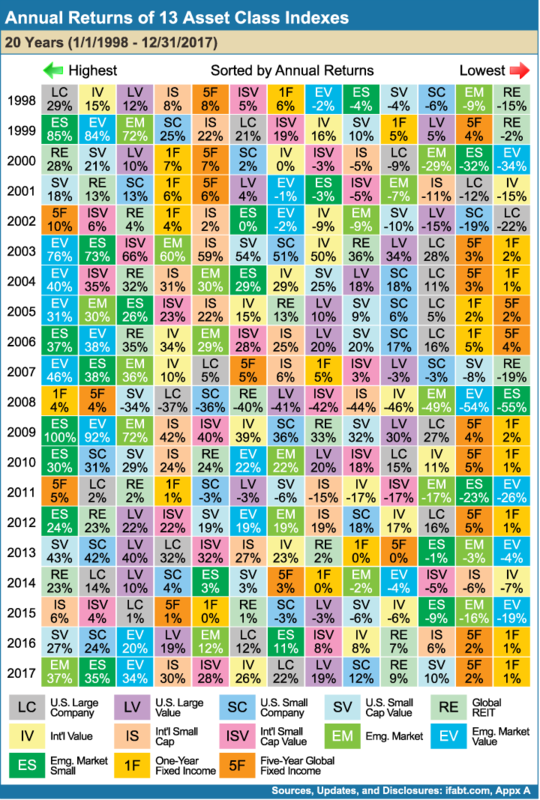 Looking at the active domestic equity funds tracked by Standard and Poor’s, only 38.93% remained style consistent over the fifteen-year period. Investors should carefully review Morningstar data to determine if a fund has a history of adhering to its stated investment style. Because passively managed index funds adhere to their styles, they provide investors with consistent risk exposure and the assurance their funds will stay true to their purpose. 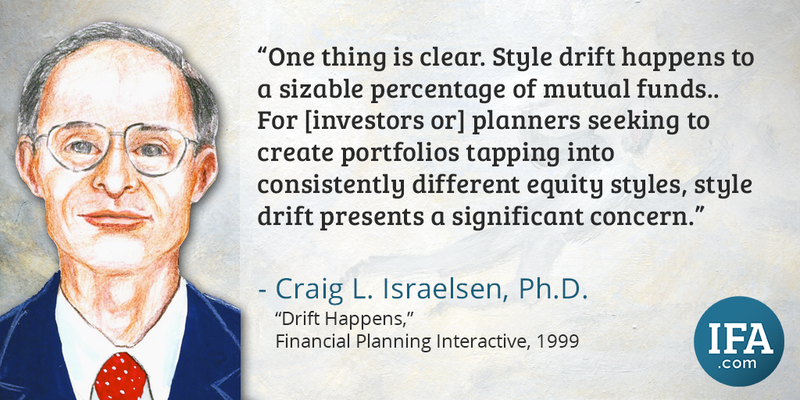 Wise investors avoid the pitfalls of style drift in two ways. First, they resist the temptation to overweight or underweight asset classes that may be touted or spurned based on speculation or hype from so-called experts or the financial media at any particular time. Second, they steer clear of actively managed funds because these are also notorious for style inconsistency in an attempt to beat the market. Instead, wise investors avoid the perils of style drift by holding a consistent allocation of index funds, permitting them the full benefits of a risk appropriate investment in the global markets. 2S&P Indices, Research and Design, "Standard and Poor's Indices Versus Active Funds Scorecard (SPIVA), Year-End 2017)," (2018).